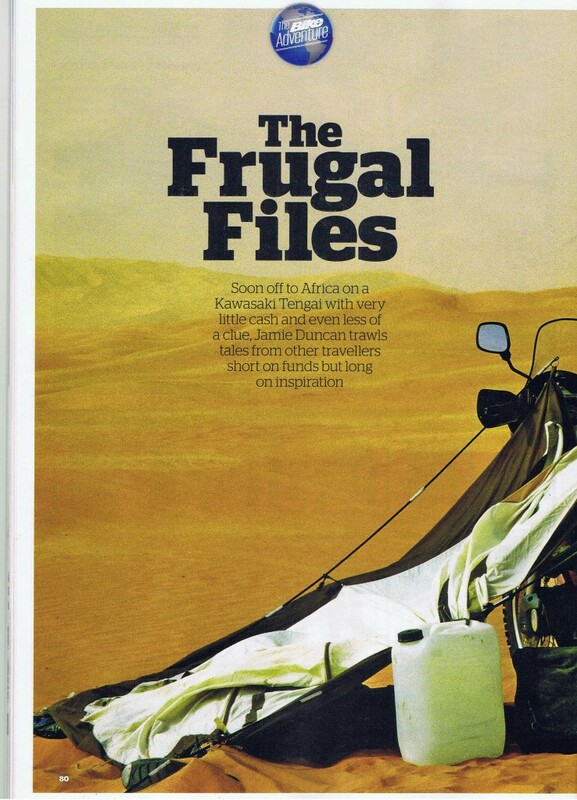 Motomonkey Adventures is proud to be apart of the Frugal Files in Bike Magazines UK latest issue! 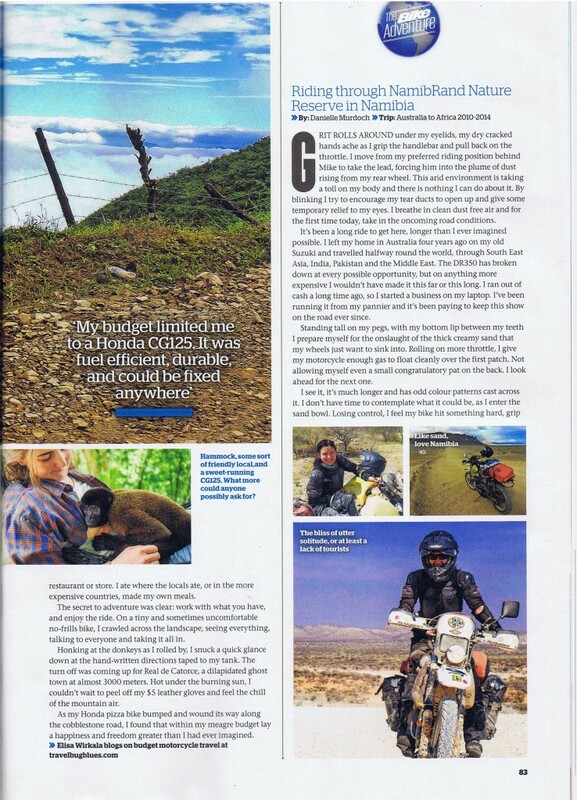 My article is a long side motorcycle travel giant Chris Scott known for his Motorcycle Handbook and Elisa Wirkela who is travelling around the America’s on a 125! a big shout out to Jamie Duncan who put it all together. Happy reading. 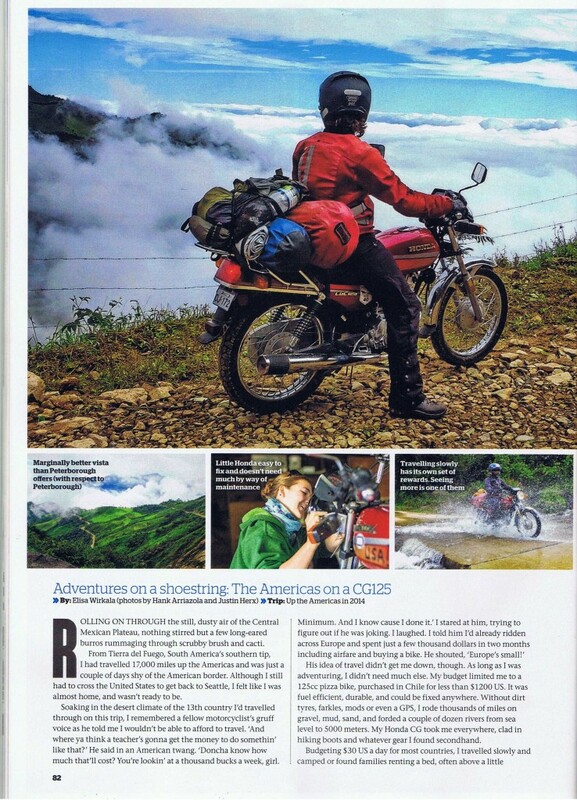 Below is a copy of the article before editing for the magazine. Grit rolls around under my eyelids, my dry cracked hands ache as I grip onto the handlebar pull back on the throttle opening up the gas. I move from my preferred riding position behind Mike to take lead, forcing him into the plume of dust rising from my rear wheel. This dry, arid environment is taking a toll on my body and there is nothing I can do about it. By blinking I try to encourage my tear ducts to open up and give some temporary relief to my eyes. I breathe in clean dust free air and for the first time today, take in the oncoming road conditions. Standing tall on my pegs, with my bottom lip between my teeth I prepare myself for the onslaught of the thick creamy sand that my wheels just want to sink into. 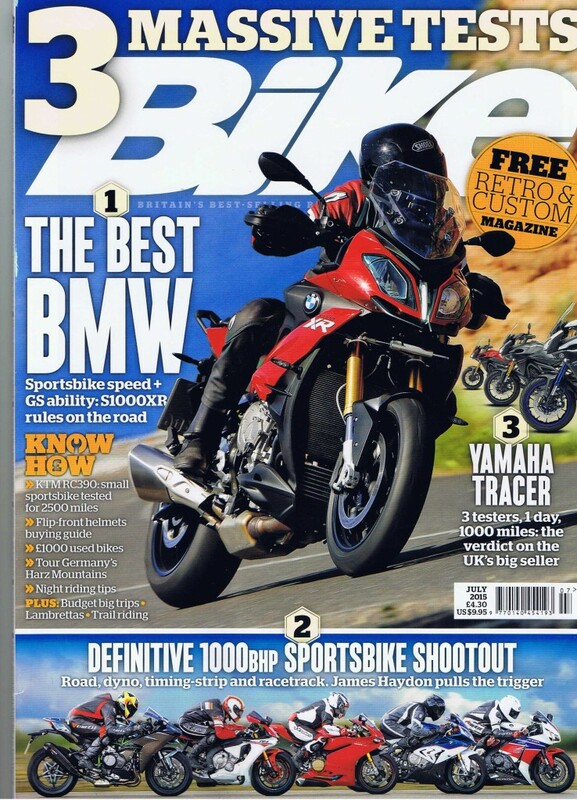 Pulling back on the throttle, I give my motorcycle more petrol and float cleanly over the first patch. Not allowing myself even a small congratulatory pat on the back, I look ahead for the next one. I see it, it’s much longer and has odd colour patterns cast across it. I don’t have time to contemplate what it could be, as I enter the sand bowl. Losing control, I feel my bike hit something hard, grip and force us forward and upwards. I land upright in a sandy trough between several large waves of dirt.This must have been the strange pattern I saw. I never knew the earth could be so cruel and combine deep sand with these hard corrugations. Bouncing from one to the next I tell myself that I am in control. That is Namibia for you – it gives you every type of road condition you can ever dream of without asking for it. My eye catches movement in the distance. My attention splits between the unpredictable road conditions and a group of blurry dark shapes slowly moving across the plains. Excited, I slam on the brakes, kill the engine and glide to a stop. Fumbling with my gloves, I grab the camera from my tank bag as Mike pulls up next to me and turns his engine off. Silence surrounds us. With the change in background noise, the blurry shapes scatter. Reforming a group they move towards us. The fuzzy vague shadows sharpen as they move into our field of vision. I want to rub my eyes, as I stare in disbelief. Semi-cloaked in a cloud of their own dust, a blur of legs, black and white stripes, horns fly across the road. One or two stop in the middle of the road and stare back at us with curious eyes. The herd of zebra, antelopes and jackals moves deeper into the plains until it becomes a mirage once again. This, as I look around and take in my surroundings, is Africa. 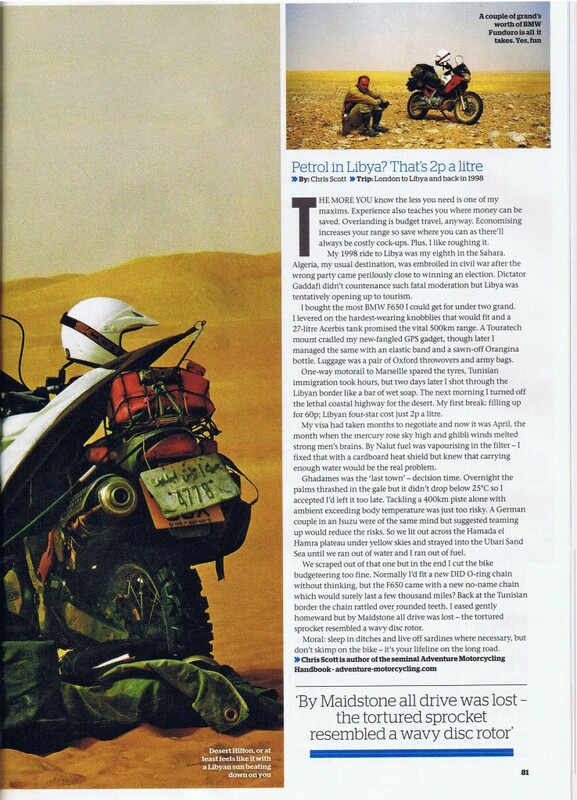 I left Brisbane, Australia in October 2010 on my Suzuki DR350 with the idea to travel halfway around the world from Australia, overland through countries such as Sri Lanka, controversial Pakistani and war torn Syria to get to Africa. In 2011 I started my African section of the journey. 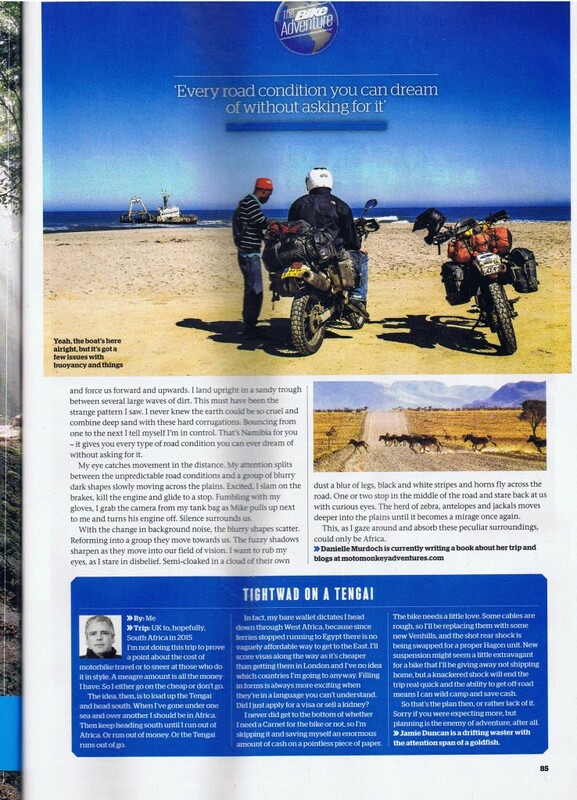 Heading down the east coast of Africa, I met Mike, a solo rider on a Suzuki DR650 from Holland. Mike rode down the West Coast of Africa and was heading up the east coast until we meet. From Kenya onwards, we continued my adventure together. Eventually, I ran out of cash, built a creative digital agency which I managed from my pannier bags. Four years later, we decided enough was enough. I abandoned my motorcycle with customs at Victoria Falls, Zimbabwe. I am currently in the process of writing my book about my adventures. Thanks for the Frugal File link. I wondered what had happened to you! Unfortunately, the typeface is too small to read on my laptop, never mind a phone. Hi Ken, Thanks for reaching out, I will post my version of the article before editing below the images for you! A good read , but way too short. Can’t wait to get my advance copy of the book. Oh… I know – I will get cracking on the writing!